n Bligh had barked orders! I guess only the owner can make decisions on sail change. Everyone knew what needed to be done and we set for the task at hand. By 5:25 we had the jib swapped out and were ready to go. The beauty of competent sailors working together! We got to the start area and called for course 14A1: Start, Blacks, Gov and back to start. I did not want to put everyone through a transition zone out to Mile buoy and kept it all inside. We had eight boats out for the fun and gave the horn signal for the 5 minute countdown. We had Fred Molnar on the helm and he absolutely nailed the start. 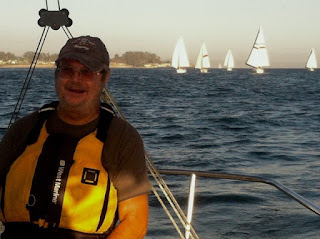 As Ernie Rideout used to admonish: “start ahead of everyone and build your lead!” It is so much easier when you do not have boats close by to disturb your wind. For the first time in a long time we were looking back at the fleet battling for clean wind. Actually on the way from Blacks to Gov, it seemed like some boats were closing in a little. After Gov, we sailed outside until we hit the layline for the finish at the start mark. The question as always was: Inside or outside? Since we saw the current was flowing from East to West inside, we stayed outside to not fight the current. At the finish, it was Pair A Dice, Pacific Spirit, Makani, Saber 34, Sea Quest, Kicks and Aolean. It was yet another gorgeous night for a sail. Over dinner at the Crows Nest, there was some interesting discussion about the rules. Apparently, there was some confusion on the course about rule 13. Rule 13: WHILE TACKING. After a boat passes head to wind, she shall keep clear of other boats until she is on a close-hauled course. During that time rules, 10(opposite tacks), 11(same tack, overlapped)and 12 (same tack, not overlapped) do not apply. If two boats are subject to this rule at the same time the one on the other’s port side or the one astern shall keep clear. This means that if two boats are on port tack and one tacks over to starboard tack, they must be close-hauled in order to call starboard tack rights over a port tack boat. This is where a good crew comes into play. That jib sheet needs to be sheeted in quickly in order to claim your starboard rights. Fred at the helm Pair A Dice finally in the lead. NEXT WEEK IS BARBECUE NIGHT AT THE YACHT CLUB. BRING YOUR FAVORITE FOOD FOR GRILLING. THE CLUB AND THE BAR ARE OPEN. There seems to be some confusion as to when a boat is tacking. My take is that a boat is tacking from when she passes head to to when she is on her new closehauled course. See RRS# 13 below, there is no mention of sails or boom. After a boat passes head to wind, she shall keep clear of other boats until she is on a close-hauled course. During that time rules 10, 11 and 12 do not apply. If two boats are subject to this rule at the same time, the one on the other’s port side or the one astern shall keep clear. September 1, 2015: "AWESOME WIND"